The focus of going local has been all the rage for several years now, and it seems like a no-brainer around here, given the proximity to the farms that produce the food. But what do you do when you live in the city, away from the fertile soils required to grow your own meals? 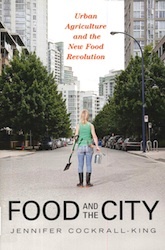 This week’s featured title takes a look at the farm-to-fork movement inside the concrete jungle of urban life. Cockrall-King, food journalist whose works have appeared in a number of major publications, goes all over the world to show how major cities have actually been supporting the now-widespread trend of urban agriculture. She starts out by exploring the current state of affairs with regards to the industrial food scene and increasing food crisis. The author then traces the roots of farming in the metropolis to Paris and highlights additional shining examples of cities that excel at it. The Midwest, as it should be no surprise, is well represented with Milwaukee and Chicago as two of the featured standouts. The book serves as an excellent foundation in learning about the trend’s impact on city living. This entry was posted in new stuff tuesdays and tagged agriculture, books, new stuff, urban life, urban planning. Bookmark the permalink.